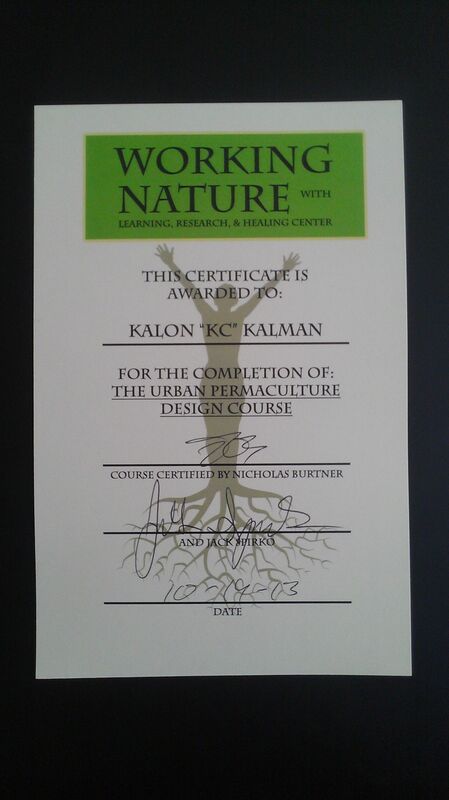 On October 15th to 20th, 2013 I attended an Urban Permacuture Design Course at Jack Spirko’s property. Jack Spirko is my inspiration to get into permaculture. Jack’s website is http://www.thesurvivalpodcast.com. The teacher for the course was Nicholas Burtner. Nicholas’ website is http://www.workingwithnature.org. This was the second time I visited Jack’s homestead. The first time was back in May of 2013 for a “woody bed” workshop. The purpose of the urban workshop was to take a portion of Jack’s homestead and use it to simulate the limited spaces available to design in an urban or suburban landscape. Placing confines or limitations on a design made this a challenging and enjoyable experience. We spent two days of lecture followed by a day to design. The lecture was a relaxed atmosphere with teaching that really engaged the audience. I enjoyed material that reviewed what I learned in my PDC as well as new material and experiences unique to Nicholas. At the end of the design day we presented our designs. We learned how to present a design in a professional manner that required us to use our skills to communicate with Jack and Nicholas role-played as customers. A true testament to Nicholas as a teacher was his ability to recognize that his students had to learn a lot of material in a short amount of time. There were also about 8 of us that completed a PDC and the other students would have been overwhelmed individually. Since there were over 30 people he had us break into groups of 5 to 6. This allowed us to pool our creative resources and come up with some really unique designs. The best part of the whole course was watching the amazing ideas produced by each group. Every design had one or two elements that stood out from the rest. A truly memorable experience with good food, good people and good fun. I also got to meet Jack’s intern Josiah Wallingford. It wouldn’t have been a successful event without Dorothy Spirko, Jack’s wife. I was happy to have earned my certification. Categories: Certification | Tags: Jack Spirko, Nicholas Burtner, Permaculture, Urban Permaculture | Permalink.